Are you on my mailing list? If not, you should sign up! Don’t worry, I won’t inundate you with lots of emails. I usually send out 1-2 newsletters a month. 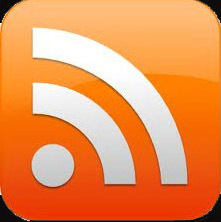 Newsletter subscribers get updates on events and products, and occasionally, will get special coupons and discounts! So, what are you waiting for? Sign up now! Also, please note that this blog has moved to a new home, to my new website! 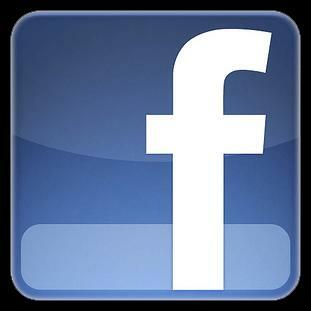 To find the blog in the future, please go here. 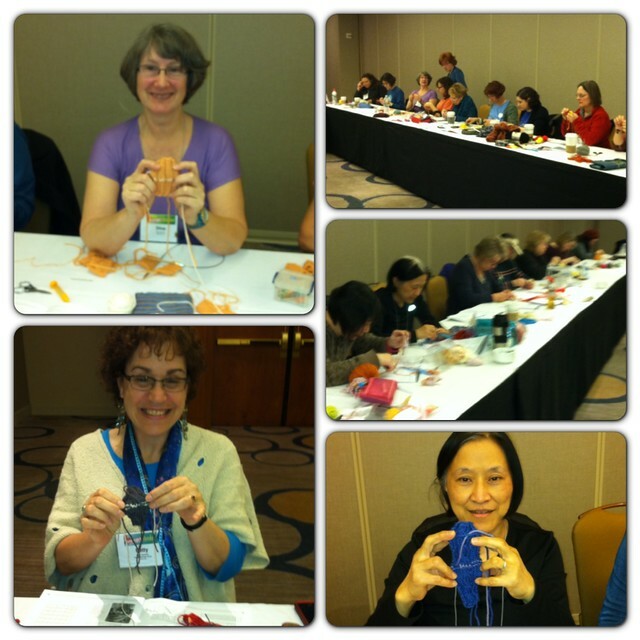 As of this writing, I am currently sitting in my hotel room after a long but fruitful weekend teaching at Stitches East. Throughout the weekend, several students and colleagues have mentioned that they saw a Craftsy promotion with me in it. What is it you ask? 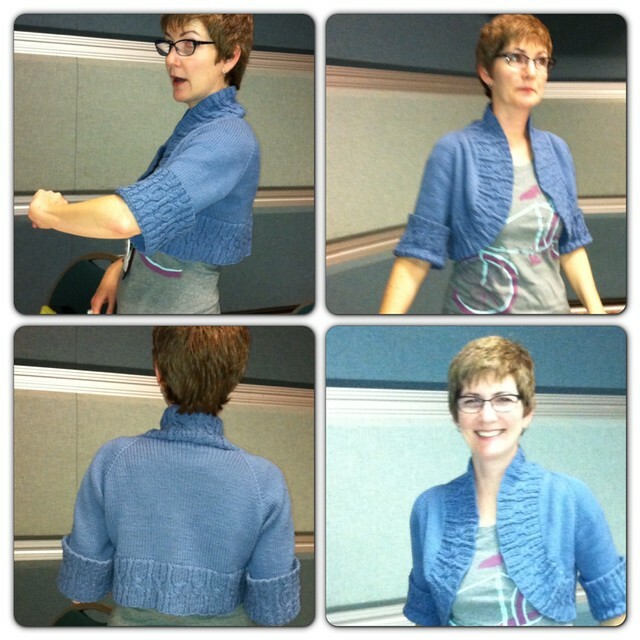 I am the designer/ instructor for Craftsy’s December Knit-along!! I was so excited when they asked me to design and lead the KAL and am even more excited that I can now let the cat of the bag! Here’s the link to the details for you to sign up. 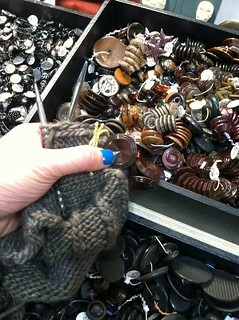 Because it’s a mystery knit-along (KAL), I can tell or show you exactly. However, I can give you some hints and teasers! 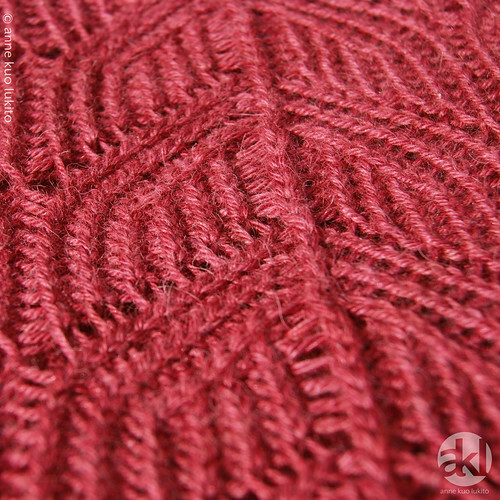 The yarn I used is Lorna’s Laces Honor in color “manzanita.” Craftsy is offering the KAL kit in 3 different color options: manzanita, blackberry and waistcoat. You can’t go wrong with any of the colors, because the folks over at Lorna’s Laces make beautiful yarns in beautiful colors. The Craftsy Mystery Knitalong Workshop is a step-by-step web-based tutorial with in-depth written instructions and close-up photos that guide you through the pattern. 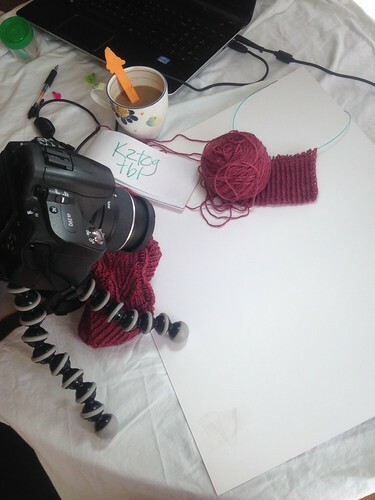 Below are photos of my set-up for taking tutorial photos and an example of one of the tutorial photos. The workshop will also have the a handy printed pattern you can print out and take with you on-the-go. 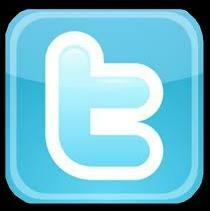 What you are seeing, my friends, are different variations of my new logo! I am so excited by these that I am sort of letting the cat of the bag a tad early. I am moving towards a shift in my business and am rebranding all my patterns under my own name. I’ll still have Crafty Diversions, but it’ll go on a slightly different track. I can’t tell you everything just yet (soon), but all the changes are going to be quite exciting and for the better. If you’ve been reading this blog and/or following me on Twitter or Facebook, you probably know that the Crafty Diversions site is undergoing some major construction changes. The http://www.craftydiversions.com site will have a new look some time in May, though it will likely continue to be a work in progress throughout the summer, as new features are tested and added. Part of that change will also include a new website for my Anne Kuo Lukito designs and pattern line. The website is not up yet, but if you want to bookmark it to check it out in the near future (sometime in May), it’s http://www.annekuolukito.com. So what does rebranding my patterns mean? 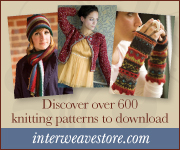 It means that over the next 6 months, I will give all my patterns a makeover. All the content of my patterns will be the same, but they will just have a different look and layout. By the way, the AKL logos were designed by talented Photographer/ Graphic Designer, Zoe Lonergan. She’s also the designer behind the Visionary Authors logo, the book designer for Hunter Hammersen’s Knitter’s Curiosity Cabinet series, photographer for Hunter’s KCC2 and the upcoming KCC3, and the book designer and photographer for Sandra McIver’s monumental book, Knit, Swirl. My original Crafty Diversions logo, was designed by my talented medical illustrator/ artist/ nurse practitioner sister! A message from Craftcation that I think we all should strive to be everyday. Photo: courtesy of Matthew William Photography. The Craftcation pop-up shop. Do you see the awesome 😉 gift tags? Photo: courtesy of Matthew William Photography. The awesome bar at the BBQ. Photo: courtesy of Matthew William Photography. Tons of people at the opening night reception and BBQ. 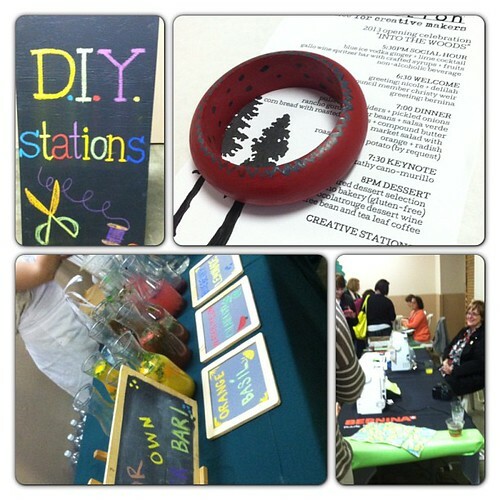 The was great food, an fun and awesome bar, and DIY craft stations! Photo: courtesy of Matthew William Photography. Hey, it’s me teaching! Photo: courtesy of Matthew William Photography. Unfortunately, I had to go home early and work (boo) and I missed the 80s party on Saturday. Susan (L) and Lauren (R) of Creative Outlet Studios seem to be having a blast (and they did all the props) with Craftcation organizer. Photo: courtesy of Matthew William Photography. Seriously folks, you should try to attend Craftcation in 2014 if you can. It’s fun and inspiring. 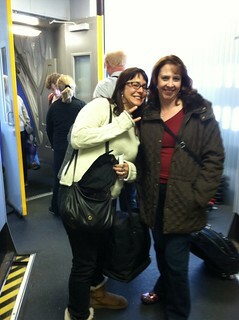 I enjoyed the opportunity to meet and network with other creatives outside of my knitting world genre. I also was able to hang and chat with friends Megan from Creative Bug, Lauren and Susan from Creative Outlet Studios (fabulous multi-crafting space in Costa Mesa!) and Alicia DiRago of Whimsey Box. I also met several new friends, including a few knitters and Carol Cho, marketing/business development specialist at Kollabora! Please note that the first 6 photos are courtesy of Matthew William Photography. You can see his work and more Craftcation photos on his site. The rest of the photos are mine. From the Thursday night BBQ. I painted the bangle at one of the DIY craft stations. I took a quite breather before teaching my workshop by enjoying the beachside venue. This is why I love California. 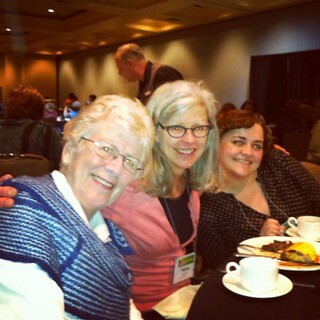 And of course, I made up and found my own little knitting group while at Craftcation! 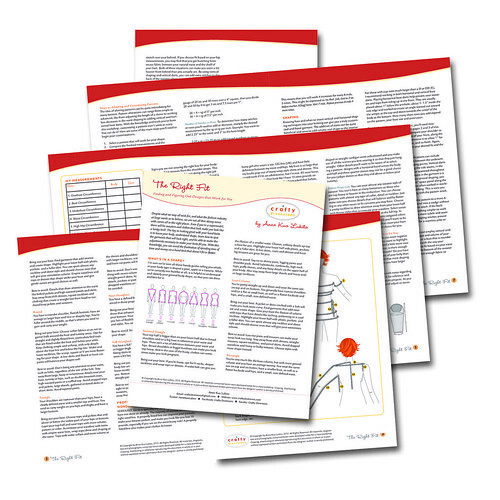 Snapshot of the handouts for “The Right Fit” class. In “The Right Fit,” we will discuss different body types, evaluate your body type and shape, how to measure your body, how to adjust for problem areas, what knitting patterns to select for your body, how to make modifications and adjustments to your knitting to best highlight your assets and hide those problem areas, and much, much more! This is definitely a hands-on exploratory class for everyone. If this class is taught at a yarn shop, we will also talk about color selection and go around the shop to look at yarns. 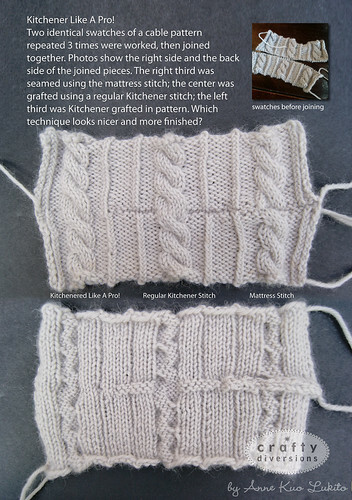 Comparison of the mattress stitch (right), regular Kitchener (center) and Kitchenering in pattern (left). In this class, we will learn how to graft in pattern. 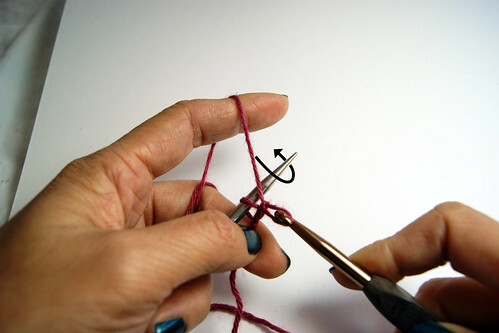 We will talk about stitch theory to help you understand why your needle will go one way and not another, the mechanics of the Kitchener stitch, the mechanics of Kitchenering in pattern and situations in which this technique can be useful. I also have developed an easier method for you to read grafting instructions and will teach you how to use this method to make it easier for you to graft in pattern. We will practice grafting different kinds of stitches, including Stockinette, reverse stockinette, seed stitch, different rib stitches and cabled stitches. 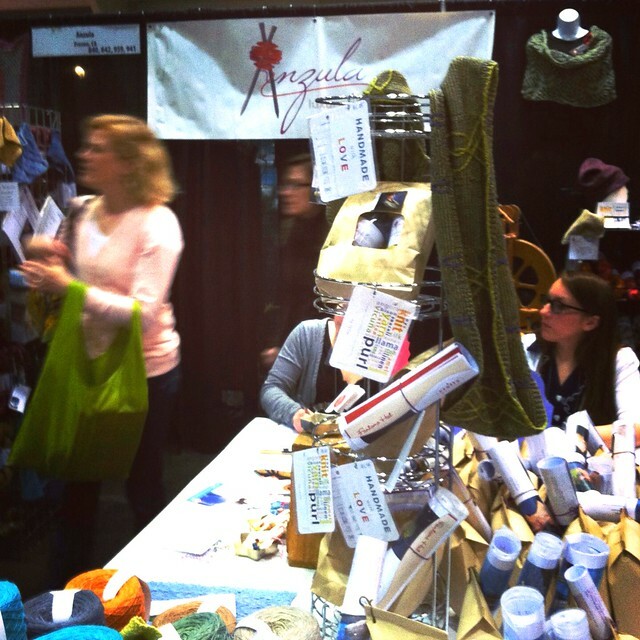 As usual, Stitches West this year was great fun. 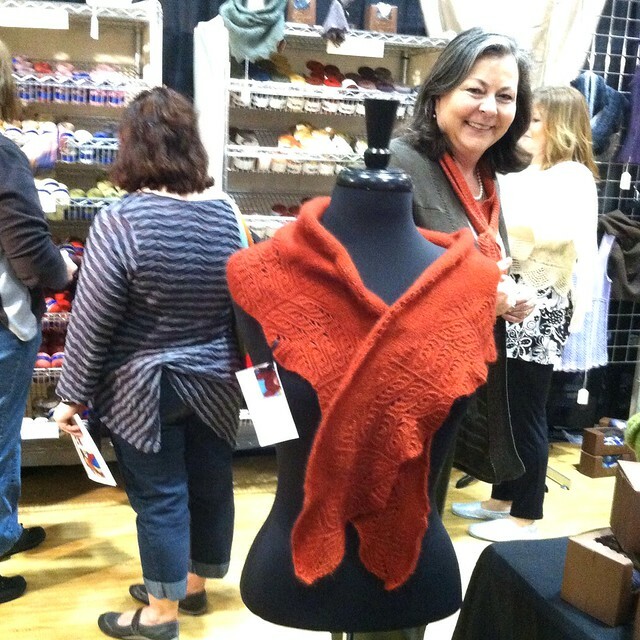 I always enjoy the excitement of the show, the camaraderie of knitters, my wonderful students and friends. And I really have to say that the XRX/ Stitches staff does an excellent job putting together a show of such mass proportions! I taught 3 classes: Kitchener Like A Pro (grafting in pattern off the needles), The Right Fit (your body shape and finding/adapting knitting patterns appropriate for it) and DIY (Design it Yourself): Shawls and Stoles (tons of shawl shapes and how to achieve it). Kitchener Like a Pro and DIY Shawls & Stoles were sold out very early on in registration and I had only 3-4 spots left in The Right Fit, but by the time all the classes started, all my classes were sold out (I capped all classes at 25 students). THANK YOU STUDENTS! Students from my “Kitchener Like A Pro” class working hard and showing off their successfully grafted ribbing and cable swatches in pattern. Cal was in my “The Right Fit” class. She is showing off the “Mera, Revisited” pattern she made after taking a class on that pattern the year before at Stitches. “Flame” is a crescent-shaped shawlette worked in a really cool reversible edging pattern and it was on display at the Windy Valley Muskox booth, where they sold out of about 50 patterns of Flame within the 1st hour of the 2nd market day! Anzula had “Fantome Hat” and “Fantome Cowl” both on display and selling as a kit with their Sebastian (merino/seacell) yarn. They also sold some soft launch test products of my gift tags. 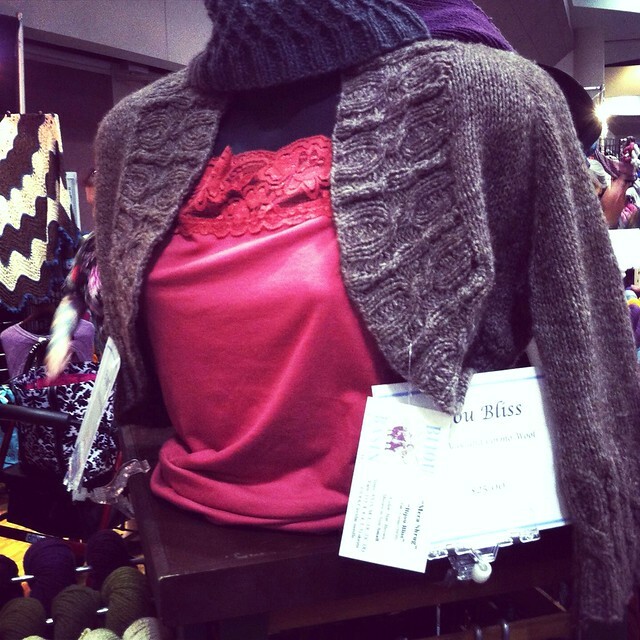 And my friends at Bijou Basin Ranch, had the “Mera Shrug” on display in their booth. 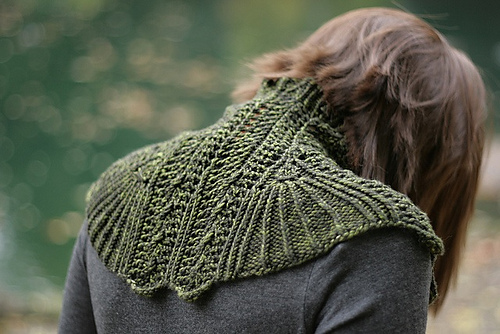 That was one of my favorite projects because the yarn was Bijou Bliss, a yak/cormo blend. Some of the other fun things from Stitches included running into Christina and Debbie from Alamitos Bay Yarn Co. on my flight, meeting 3 generations of knitters during the Student Banquet, petting all the pretty yarns, button-shopping, hanging out with my friends, old and new, and just being able to be part of it all. 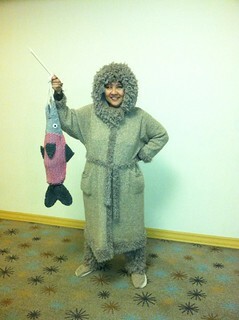 Oh and let’s not forget my first encounter with an Inu-knit (aka Lily Chin in costume)! Folks, I also want to let you know that my website is going through a major facelift and some construction woes. You can still navigate and purchase from it, but I cannot list new stuff on it. 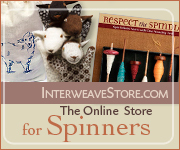 So, for the time being, you will see a new tab at the top of this blog, “~~PATTERN & PRODUCT INFORMATION~~” That’s where I’m putting and listing all my new stuff. Thanks! !